Welcome to my newly reorganized studio. Would you like a cup of tea or coffee? My sister Marcy Voyevod, an interior designer with an amazing sense of spatial relations, came over last Wednesday night to give me some suggestions on how to rearrange things in my studio. I’d told her I wanted to move my easel so that it wasn’t in front of a window. 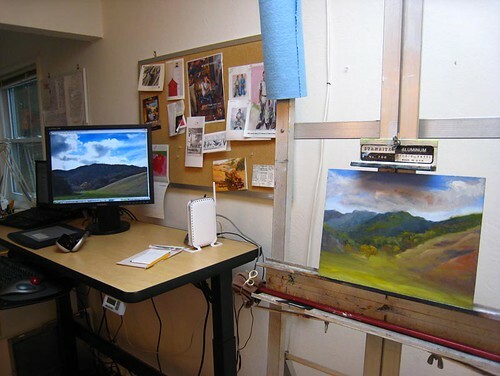 I also wanted to be able to see my computer monitor from my easel so that if I was going to paint from a photo (or finish a plein air painting at home from a photo as I’m doing here) I could work from a more life-life image than a printed photo. As you can see from the above photo, we did it! I was amazed when she started actually moving furniture around and coming up with one brainstorm after another. She advised me to clean out a closet in the next room (where I was storing random stuff and old clothes I don’t wear but was mostly used my by my cat for quiet napping during the day) and use that closet for all the canvases that were stacking up in the studio. Of course closet cleaning lead to the two of us trying on old clothes, deciding what she’d take and what would get donated, and lots of laughs. View into studio kitchen (which also got some cabinets cleaned out to make room for supplies that were cluttering up the place). 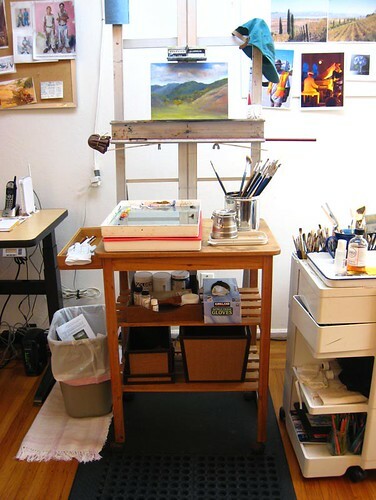 I’d been trying to figure out a solution for something to use in front of the easel to hold my supplies since it would no longer be next to the table where it was before. This butcher block cart that originally held my family’s very first microwave back in the early 80s and had been holding a plant for the past few years worked out perfectly! I bought a little bamboo drawer organizer from Marshalls and screwed it into the side of the cart for a little extra storage. My son Cody helped me move the ceiling light with it’s special daylight bulbs (which went much faster than when he installed it the first time). I gave Marcy a purple desk chair that didn’t look right in the studio but perfectly matched her purple combo guest room/computer room at her house and she gave me the drafting stool I’d been coveting for years from her house. (oops…I’m giving that computer under the table to the kids next door…one more thing I’m getting rid of so it shouldn’t be in this picture). That’s my air cleaner towards the left there. I posted these pictures and more with notes on them about individual items in the pictures on Flickr. You can get there to view them by clicking on any of these pictures. Just look for any of the pictures that say “Notes” under them and click on the picture and mouse over the little boxes on the picture. Thanks for the coffee! You have a great studio, thank you for inviting us. WOWEEE Jana!! What a fabulous place!! I think your studio is as large as my entire house!! What a glorious place to create, dream and be inspired!!! And to have it so tidy!!! BRAVA!! What a great job ….. and great place! Can we all move in now? I am inspired. 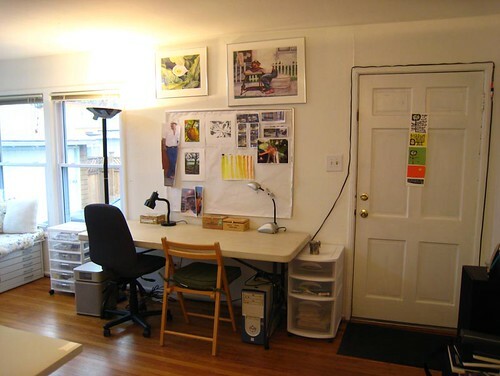 Your studio looks wonderful and you have giving me an idea on how to improve my working space. WOW. Does Marcy travel?! I’ll even let her try on my old clothes! HOORAY FOR YOU, girl, it’s wonderful! Jana, I want to print this and when we ever sell this house and get a new one, use the photos to remind me of what your studio looks like. I’m drooling dangerously onto my keyboard over all your flat files. Thanks for posting! PLEASE tell Marcy to come to New York!!! Oh lordie this is sooooo BEAUTIFUL! Andrea, I don’t have one of those carts for canvas, but I do have a closet in the next room (supposedly a bedroom but actually my exercise room) and that’s where my sister had me put my canvases, which is working great! At some point I’ll make dividers so it will be more like one of those carts. 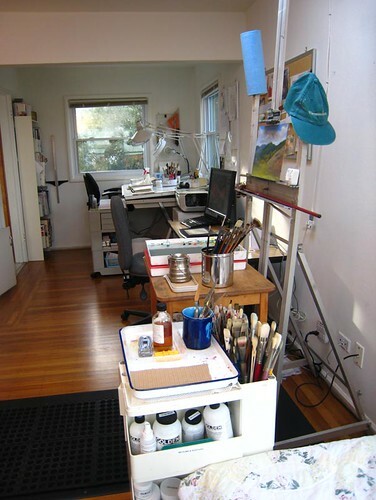 Carol G, I’ll see if I can find some Before pictures, but honestly, it enough of a mess for Oprah…I had another drawing table in there, another cart, stacks of paintings in one corner, the easel was between the long table and window seat (so that I couldn’t open the flat file drawers under the window seat, and instead of a compact scanner/printer I had a big ol’ scanner and a big printer, taking up more space. And messy stuff on top of all the tables. Lin, It’s not as big as the pictures make it look but it definitely feels more spacious now! Oh GREAT job! Your studio is WONDERFUL!!! I’m jealous. What a wonderful tour of a wonderful studio for a Wonderful Artist!!! Thank you very much – and now I am Inspired!!! What fun to take a tour of your studio! I too did the de-cluttering and cleaning out this past week and am in love with my space once again. I love the corner bed and window area! That is simply amazing! You truly deserve it. I bet you are already SO inspired :-)! Thanks for sharing. Hi Jana, I THOROUGHLY enjoyed your virtual studio tour- what a treat! 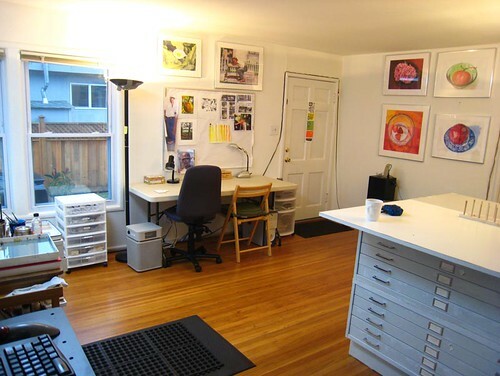 I loved the pillows on your flat file- clever 🙂 It must feel wonderful to work in your newly organized, spacious, rearranged studio. OK – I am so jealous 🙂 What a wonderful space to hang out in and be creative. Bravo! Well, thanks for the offer of coffee (strong and black, no sugar) and for the studio tour. Like others, I could use the Super Sisters in this rat’s nest! I’m inspired too. As soon as my “work” is done before the holidays, I’m going to trash stuff, re-arrange and PAINT. Aaargh!!!! 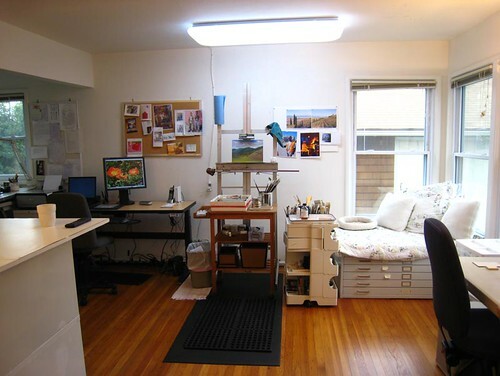 I want a studio like this! Unfortunately my earlier comments didn’t seem to register on your blog but the impression of this wonderful studio did so in a very emphatic way and it’s being blogged about today on my blog – along with one or two others who’ve been having a tidy up pre-Christmas! Jana – this is just so nice. I mustn’t look again or the drooling will get really bad………..
You must be sooooo excited!! Congratulations on completion of your big job. We look forward to seeing lots of your future work…. 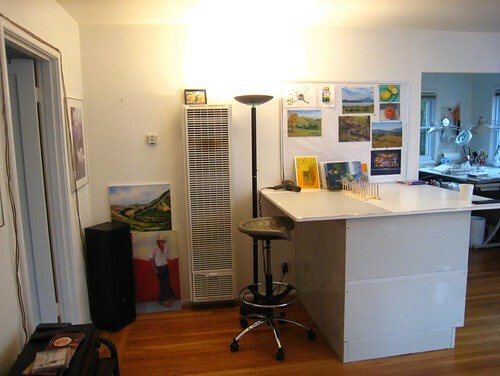 Your studio space looks great! I love seeing your artwork on the walls and in progress! I hope you are having a great holiday season! Now that’s what I call a studio! 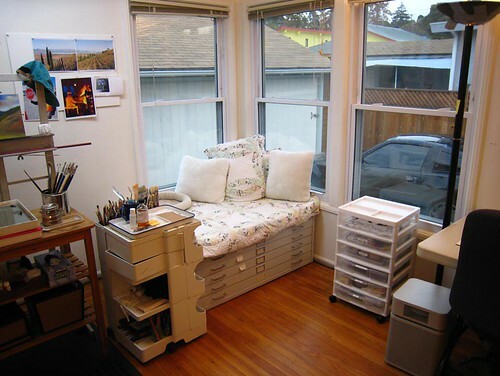 And I love the idea of the flat file storage window seat. Certainly a studio to dream of Jana. Wow! Your space looks great. You’ve inspired me to re-do the space that I have. You sister had some wonderful ideas (that window seat is perfect). Enjoy! Nice studio! I need to get my act together and organize mine. Some day! wow jana. your studio looks great. It’s so completely neat! Mine is a disaster zone right now. You’ve inspired me. I love it! It is so beautiful! I like the way now you have used your space! I’ve been wanting to get back here and comment since i saw your studio on flickr. 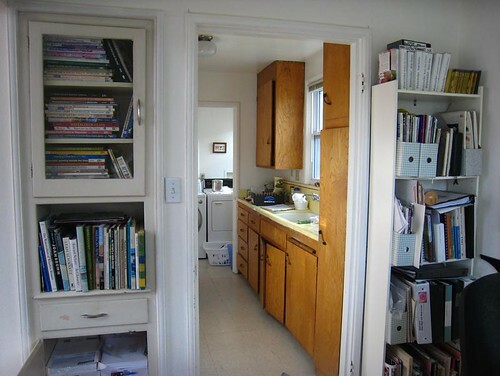 Love your studio, especially the adjacent studio kitchen. What an inspiration for the new year! Clean studio, fresh start! Could your sister start a blog please? Would she like another sister? 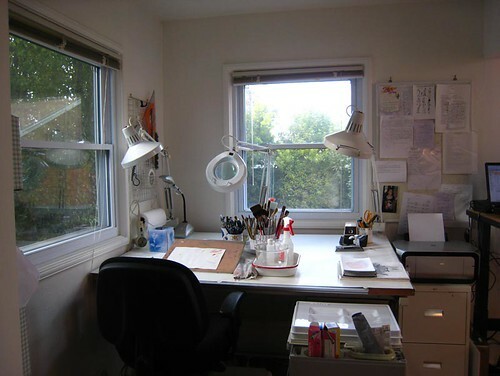 Thanks for sharing the images of your studio. Rearranging and cleaning out certainly helps once in a while. I really like how you arranged your computer screen in close proximity to your easel. Your studio looks great–good lighting and open–your photos are bright and clean also. Have a Merry Christmas and I will see you around in the next year. I enjoy your artwork and your comments. I love your studio Jana!! It looks wonderful and light, creative and filled with inspiration….and a place where your cats have loads of corners to curl up in! I would never set foot out of it, were it mine….ENJOY it! Your studio is lovely! We are in the process of building one in our house and yours gives me loads of inspirations. What a beautiful studio! Thank you for the virtual tea and the charming advice that comes via your brilliant sister. It is all so lovely. And it’s fun to see your pictures where they live!